nice child-friendly camper with which we have traveled a lot of carefree. Time to share our camper and our experiences with others. 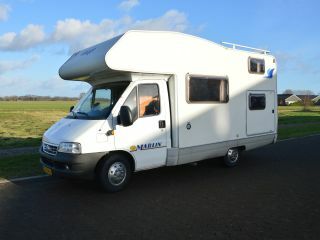 The camper is very spacious with an extra high alcove with large double bed with mattress and topper of 2.10m long. Bunk bed from which the upper bed is to be built is as a top closet and the bottom as a cot with 60 x 120cm mattress. Large clean fully equipped kitchen with very extensive inventory, spacious train seat (to build for 2 person bed) and plenty of closet space. Neat bathroom with sink, toilet and separate shower. TV / DVD (turnable to train and to bed) and bleutooth audio with speakers inside and outside (!) 2 storage rooms filled with plenty of chairs, tables and other camping items. 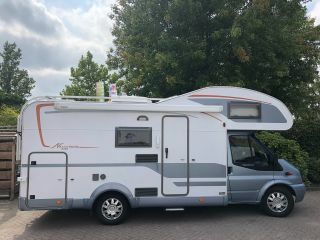 With the double air suspension, the very strong engine and the very complete child-friendly interior, this is a very nice travel camper. Feel free to contact us for a free visit. other pick up and return times as mentioned are negotiable. possibility to pick up and / or bring the camper. there is no smoking in the camper. The camper needs to be clean when returning the inside. This meant interior clean swept / sucked and kitchen with inventory washed. The toilet emptied and cleaned. The fixed cleaning costs are for the cleaning of the interior and for the exterior.